I'm a minimalist, climbing clutter drives me crazy. One of my recent attempts to unclutter my daily climbing routine began with a new daypack. I was so impressed with my new Chernobyl that I went ahead and ordered a cragging pack from CCW too. I ordered a stock Cold Cold World Ozone before I left for Washington. Before we get any further I'd like to get a few things straight. Many packs are measured in liters. How many cubic inches are there in a liter anyways? Well, it turns out there are actually 61 cubic inches in each liter, so when you're trying to guess at a pack's volume and you hear someone say 30 liters you know it's 1800 cubic inches. We can do simple math all day, but let's get on with my real point. From my perspective it seems like most pack manufacturers use a volume measurement, like 30L, as a rough guideline to indicate how big their bag is. Unfortunately a lot of manufacturers also really seem to miss the mark when it comes to pack volume (and weight but that's another issue for some other whine and cheese party). A good example of this was my old BD Sphynx 32. It was a lot bigger than my current Ozone but was called a 32L bag. If the Ozone is actually 2300 cubic inches, and I'm inclined to believe Randy Rackcliff on this one, that means it's volume is 37L. If that's true then my Sphynx 32 was easily in the 40-45L range, which is an entirely different size pack with an entirely different set of applications. Why don't most pack manufacturers give exact volumes instead of being vague and potentially misleading? 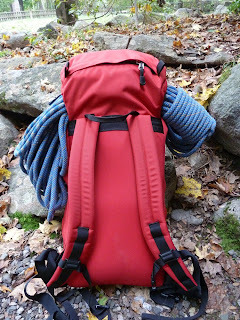 This brings me to my next point - cragging packs don't really need to be anything more than a functional durable sack with a nice set of shoulder straps. Most large gear companies feel the need to continually make fabric and design refinements to "improve" existing products. These improvements seem to come at the cost of pack durability. Rather than waste time refining already good designs with fancy crap that won't last very long, why not charge the same price for a simple well-built bag made in the US or Canada by people who know our game intimately? If these companies could cut out the bullsh*t, save money on design and marketing and make a product that spoke for itself we'd probably be headed in the right direction. The CCW Ozone is reminiscent of the timeless klettersac, a simple climbing bag meant to hold all your worldly possessions during a day in the mountains. I'm not that old, but I'd be willing to bet most climbers my age or younger have no idea what "klettersac" means, or that for generations they were the standard climber's pack. Nowadays you see zip-open climbing suitcases, expedition size packs and bags made of airy disposable ripstop fabric everywhere at the crag. One is hard pressed to find simple klettersacs anywhere these days. 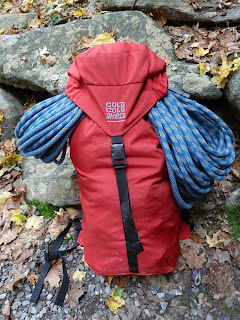 It's sort of a shame because klettersacs are, relatively speaking, cheap to produce, big on durability and functionality and small in size forcing one to actually think about what they're bringing to the cliff. You can't bring the kitchen sink along with you in a klettersac and you definitely won't look like a frumpy version of the leaning tower of Pisa as you approach the crag with this type of bag. The devil is in the details, and with the Ozone there aren't many details, which was it's most attractive selling point for me. There are four pockets total, and the whole pack is made of bright red ballistics cloth meaning it just might outlast all of my other gear twice over. There are two small zipper pockets in the lid and one along the backpad for extra storage of smaller/seldom used items. The same foam backpad that adorns all the other CCW packs is built into the Ozone too. There are no ax attachments, no compression straps and there is no padding on the 1.5" wide webbing waistbelt. It's a looker too, believe me; I get comments on the pack every day. The Ozone was clearly carefully designed to fit only what's needed for a day at the cliffs and nothing extra. It will fit a full single rack, draws or runners, harness and chalkbag, shoes, helmet, 1 or 2 extra layers, 2 liters of water (in a dromedary for me), lunch and my emergency/med kit. The rope fits unbelievably well under the bonnet rounding out a really clean functional package. There isn't a whole lot of extra space and you have to stuff things in carefully for it all to fit. I want to emphasize that this pack, despite it's overtly simple design, is one of the most well-thought out pieces of gear I own. Elastic on the underside of the lid gives it the ability to stretch right over a coiled rope, keeping it comfortably in place, even when the pack is stuffed completely full. The result of this careful, minimalist design is a pack that doesn't need a padded waistbelt to carry well. Instead, the pack rides just above the waist with everything tightly packed against your back. 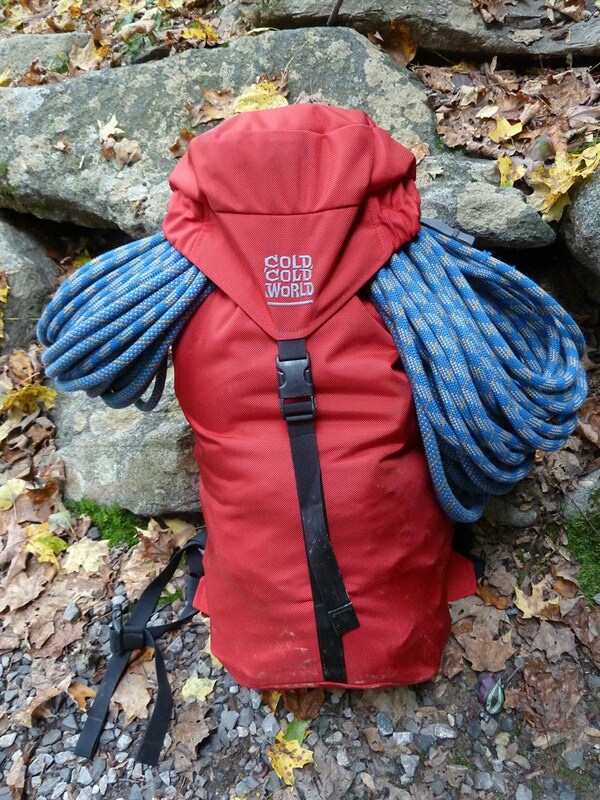 I see a lot of potential in this simple design, and knowing that Randy can custom build a pack like this in slightly bigger sizes, or with lighter fabrics makes me want to have him build a slightly larger, custom alpine/ice version of this same design for winter use in the northeast and for light overnight forays on bigger alpine objectives. If you're interested in the Ozone head over to the CCW site or give Randy a call, the customer service over at Cold Cold World rivals the quality of his designs and workmanship. All in all, the ordering experience is a breath of fresh air in our fully automated digital world, and his packs are the work of a true artisan.